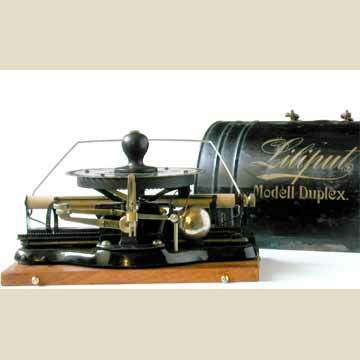 The Liliput is a solidly built a small circular index machine with rubber type fixed to the bottom of the index. The centrally placed knob is turned until the right character is in place, and then pushed to print. There were three models of the Liliput, of which the duplex, with its shift key, space key and margin stop was the most complicated. See the book TYPEWRITER, page 159.